Georgia is made from a fuzzy white material covered in black spots with flecks of pink. She has large sparkly pink button eyes and a black nose. She has black floppy ears. The siren sounds, no time for play! Georgia was introduced in September 2015. Her birthday is on 14th March. Georgia was exclusively available at Claire’s. This is the larger 9″ version of Georgia. 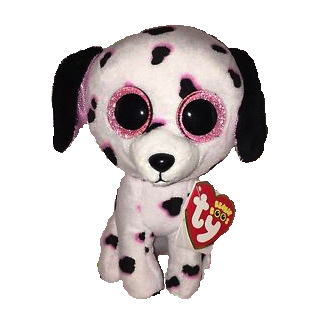 She was also released as a regular 6″ Beanie Boo.